Matcha Green Tea is not only is it delicious but it also has some really amazing benefits. It has been shown to help with skin’s moisture retention, defense against sun damage and even new skin cell development. 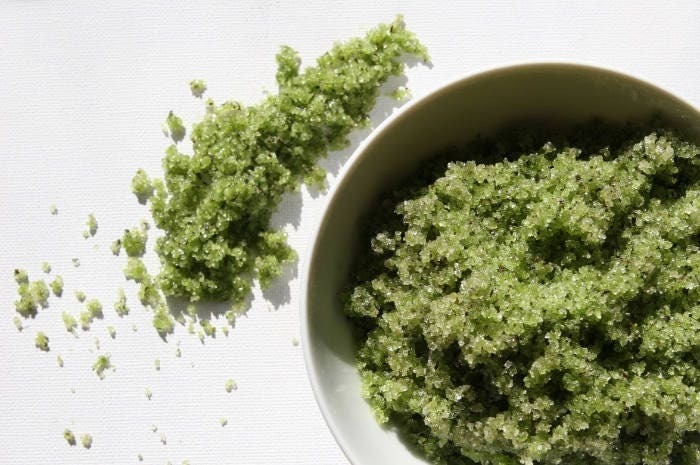 Matcha is great for the skin and when you combine it with the exfoliating properties of the sugar and sea salt this scrub is a powerhouse of awesome. Put desired amount onto your hand and enjoy. Use as often as desired. ***These statements have not been evaluated by the Food and Drug Administration. These products are not intended to diagnose, treat, cure or prevent any disease. If you are pregnant, nursing, taking medication, or have a medical condition, consult your physician before using this product. I always liked sugar scrubs, but the sugar scrubs from Jamilahs Naturals are different.. The smell lasts longer and it not only exfoliates it doesnt leave your skin dry and ashy!..I tried the chocolate and it was nice but nothing beats the lemongrass scent! I've purchased the sugar scrubs 3 times so far and I have been pleased with each purchase...truly this product is my favorite addiction! This scrub is nothing short of perfection! I only wish I had discovered these products much sooner!